You don't need to do anything, but if you are using site designs you may consider updating your user training and notifying your helpdesk. We’re updating SharePoint news to enable organizational news site designation, organizational news special visual styling, audience targeting, and the ability to organize news posts so that they display in the order you choose. We'll begin rolling these features out soon. When this change goes into effect, you’ll be able to: - Designate specific sites as organizational news sources. Once you’ve designated a site, users will see organizational news articles interleaved with their personalized news feed. The organizational news will be distinguished by special visual styling. In the SharePoint mobile app, you can filter to see all news, personalized, organizational, or news you’ve saved for later. - Organize how news displays in the news web part. The news web part will be updated to allow page authors to organize their news articles into a specific order, as opposed to the automatic rotation that occurs today. - SharePoint news will now support audience targeting. If you’ve set up groups within your organization, you’ll be able to target pages and news to these groups. The news web part has a checkbox to allow page authors to choose to show all news, or news targeted based on a group the current user is a member of. The SharePoint mobile app and SharePoint home experiences will always filter news targeted to the current user (there is no option to change or disable this setting, unlike the news web part). We'll gradually roll these updates out to Targeted Release organizations in early December. The roll out will be completed worldwide by the end of February. We are updating the “change the look” settings with additional options to enable customization of select site brand elements – specifically, header layouts, footer layouts, and navigation menu options. In addition to setting the theme and header background, site owners will now be able to switch the site header layout to two other layouts, each changing the position or displaying of header elements. The new mega menu navigation layout is only available for horizontally-oriented navigations and allows for a panel display of links up to three levels. The footer setting is initially only available for communication sites, displaying a footer that can host a logo, links, and label. Along with these updates, the Content Bar (also referred to as the “social bar”) - which contains the Like, Comment, View and Save for Later icons - will be docked permanently on top of the Comments section on all modern pages. We'll begin rolling this out to Targeted Release organizations at the end of November, and the roll out will be completed worldwide by the end of December. This is an update to an existing feature, adding more options to the "change the look" settings panel that can be optionally applied by the site owner. You don't need to do anything, but if you are using site designs you may consider updating your user training and notifying your helpdesk. When you comment on a document or presentation and use the @ sign with someone's name, the person you mention receives mail with a link to your comment. Clicking the link brings them into the document and into the conversation. Currently, this feature is available in Word and PowerPoint, and is coming soon to the new comment experience in Excel (available only to Office Insiders for now). We’ve begun rolling this out to Targeted Release organizations and are now continuing the roll out to all SharePoint Online organizations. During the course of the rollout, some Targeted Release organizations may experience sporadic access to this feature, and some documents and presentations will include this functionality, and others will not. Once the rollout completes, all Word and PowerPoint files will have this functionality, and all users will have access to the feature. We anticipate roll out completion to take place in the next weeks. After rollout completion, users will receive a notice within the comments pane informing them of the @mentions feature. Location Column is a new SharePoint Online feature. We'll begin rolling this feature out soon. Location Column allows you to add rich location data from Bing Maps or your organization’s directory to any SharePoint Online list or library. You can then filter, sort, and search by any aspect of the location data such as address, city, or state. We'll be gradually rolling this out to Targeted Release organizations at the end of November, and we expect the roll out will be completed worldwide by December 14. We’re updating the Manage Access experience in OneDrive for Business and SharePoint Online. We'll begin rolling this feature out in the coming weeks. We are rolling out our new Manage Access experience to better align with how users expect to be able to manage links and permissions on individual files and folders. We've updated the experience to make it easier to distinguish between users who have access directly and users who are accessing via links. Most importantly, this new experience will enable users to add and remove individual users on links that only work for specific people. We'll be gradually rolling this out to all customers in mid-November, and the roll out will be completed worldwide by the end of December. You don't need to do anything, but may consider updating your user training, and notifying your helpdesk. The ability to create a new associated site from within an existing SharePoint Online hub site is a new Office 365 feature. We'll begin rolling this feature out soon. After this change takes place, you’ll be able to create associated sites from within an existing SharePoint Online hub site. By clicking the "new site" button right in the hub site itself, you’ll experience our normal new site creation process and the site will be automatically associated to the hub site. Only users who have access to join the specified hub site will have this option available to them. This feature respects the global site creation setting. We'll be gradually rolling this out to Targeted Release organizations in mid-November, and the roll out will be completed worldwide by the end of December. To improve the way, we show user's private OneDrive content in Microsoft Search in SharePoint, we're making some changes to the way searches are handled in SharePoint Online. During November we will make changes to the default SharePoint Online search experience to make content from the user's own OneDrive for Business more clearly separated in the search results. With this change, the results will be clearly labeled as 'Results from your OneDrive'. We’re updating the SharePoint admin center. We'll begin rolling these changes out soon. We'll be gradually rolling this out to Targeted Release "entire org" customers in late October, and the roll out will be completed worldwide by the end of January. 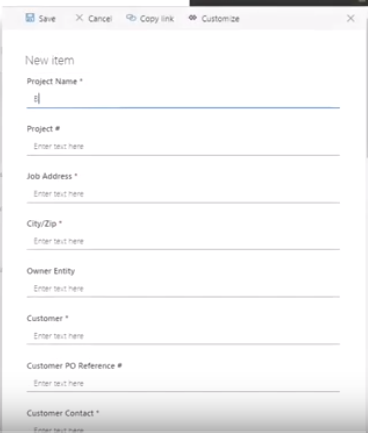 Create a reminder in SharePoint Online is a new Office 365 feature. We'll begin rolling this feature out soon. This message is associated with Microsoft 365 Roadmap ID: 34267. After this change takes place, if you have a custom date column in a list or library, you can now create an email reminder a number of days in advance of the date column selection. We began gradually rolling this out to Targeted Release ("entire org") customers in early October 2018, and the rollout will be completed worldwide by the end of October. This rollout is excluded from Office 365 subscriptions where Microsoft Flow is not available today. After this change takes place, users will be able to @mention their colleagues in the comment section of modern pages & news posts. This functionality is available in SharePoint Online and in SharePoint Online mobile apps for Android and iOS. The person who is mentioned will be notified via push notification in the SharePoint Online mobile app and in email. If the mentioned individual does not have access to the page where they are mentioned, then no notification is sent to the user. When mentioning a person, the commenter is made aware if the person does not have access to the page they are being mentioned in, and that they will not be notified of the mention. We'll be gradually rolling this out to Targeted Release organizations in mid-October 2018 and the roll out will be completed worldwide by mid-November 2018. With this new feature, we are adding the streamlined ability to add document templates to library content types. We’re also adding the ability to edit the New menu to add, hide, or reorder the new file type options. We'll be gradually rolling this out to Targeted Release customers in early September, and the worldwide rollout is expected to be completed by the end of October. After this change takes place, SharePoint Online administrators will be able to perform the following tasks to SharePoint Online team sites tied to Office 365 Groups: create, restore and change Owners of a group. We'll be gradually rolling this change out starting in October, and the rollout will continue through the end of the year as part of a broader refresh of the new SharePoint Online admin center. We anticipate rollout completion worldwide by the end of January. To help raise awareness of uncommon or accidental file deletions, we will now make a best effort attempt at notifying your users if a large number of files are deleted, and we will provide the option to restore those files. For OneDrive for Business users, if a large number of files are deleted from a user's OneDrive, the user will receive an email notifying them of the deletion and it will include an option to restore their files from their Recycle Bin. For SharePoint Online team sites, if a large number of files are deleted, the person that deleted them – either the site owner or a member – will be sent an email notifying them of the deletion and it will include an option to restore their files from their Recycle Bin. Notifications are sent to users when a higher than usual number of files are deleted per hour. This is not to be considered a fail-safe file recovery solution – it is a continuation of best efforts we are making to protect your files from accidental loss. Each email notification will include an unsubscribe link at the bottom for those that wish to opt out of this type of notification. We've begun gradually rolling this out to Targeted Release organizations, and the rollout will continue for Standard Release organizations in late September. This rollout is excluded from Office 365 subscriptions in GCC, GCC High, BlackForest, and Gallatin. -Site owners will now be able to go to lists or libraries, and click on "Configure flows", which will bring up a new panel with settings that will allow them to change the approval mode or to turn approvals off altogether. We'll be gradually rolling this out to Targeted Release organizations in early September, and the roll out will be completed worldwide in mid-September. We’re updating SharePoint Online news and are improving the modern page editing experience. We'll begin rolling these updates out soon. - SharePoint Online News updates: Besides the new carousel layout in the News web part, we’re enabling you to reuse existing content in the SharePoint Online News distribution system. With News link you can share a link to items like existing news within your company, news from your public website, LinkedIn articles, and so on. The News link will automatically show an image, title, and description for the link when available. Each of these values can be edited by the author. - Modern page editing updates: Users who go to edit a modern page will be able to see if someone else is already editing that page. They’ll be able to see who that person is and how to contact them. Additionally, to prevent unintentional page lockouts, a user’s editing session will time out after 5 minutes if no changes have been made to the page content. After this change takes place, when you ‘add a tab’ in Teams using the ‘SharePoint’ tab app, we are making it easier to choose between available lists, pages and news items -- to quickly bring them into Microsoft Teams. We'll be gradually rolling this out to Targeted Release "entire org" organizations in late August 2018, and we anticipate rollout completion by the end of September 2018. SharePoint Online view formatting is a new Office 365 feature. We'll begin rolling this feature out soon. This message is associated with Office 365 Roadmap ID: 32990. With this change, you’ll be able to improve the display of views in SharePoint Online lists with formatting. The view formatting text describes the elements that are displayed and their display style. The data in the list doesn't change. Anyone who can create and manage views in a list can access view formatting from the View options menu. We'll be gradually rolling this out to Targeted Release organizations in late August, and the rollout will be completed worldwide by the end of September. If you choose to opt out, your organization will not be able to take advantage of the upcoming version setting update. Document library's versioning can be turned off by end users, and as a result, documents lose the protection of version recovery. Hence, we highly recommend you leave this setting on-by-default for the upcoming version setting update. If you would like to utilize the new file versioning settings, there’s nothing you need to do to prepare for this change. If you would like to opt out of the versioning setting update, you can use the SharePoint Online Management Shell cmdlet, and you must do so by September 30, 2018. After September 30, we will begin rolling the new versioning setting out and will honor your organization’s existing settings. The following cmdlets are used to opt out of versioning settings: Command: Get-SPOTenant/Set-SPOTenant Parameter: EnableMinimumVersionRequirement Value: True - default value, opt-in to the versioning change. Fales - opt out. These commands require version 16.0.7918.1200 of the SharePoint Online Management Shell or greater. To download the latest version of the SharePoint Online Management Shell, visit https://www.microsoft.com/download/details.aspx?id=35588. After you run the cmdlet to change the value, please check if the value is set correctly by running the Get-SPOTenant cmdlet. Click Additional Information to learn more. Save for Later is a new Office 365 feature. We'll begin rolling this feature out soon. We'll be gradually rolling this out to Targeted Release (entire org) organizations in mid-August, and we anticipate rollout completion to take place over the next few months. We’re adding an option to add rich colors to the site header in SharePoint Online. We'll begin rolling this change out in late August. Color shade adjustments to site headers can be made by accessing the "change the look" settings panel. You don't need to do anything to prepare for this change. Please click Additional information to learn more. 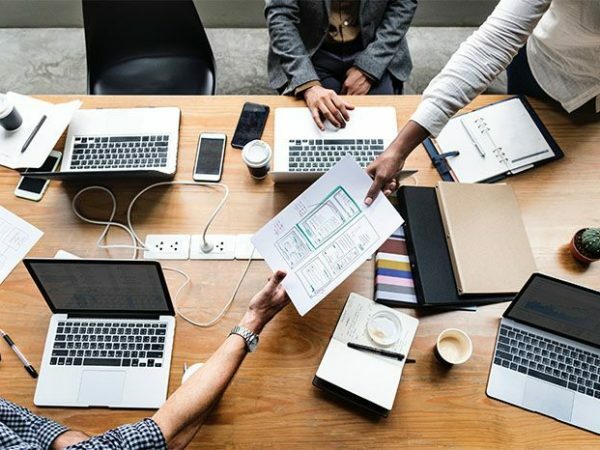 - We’re making modern team site templates available for sites not connected to Office 365 Groups (31070): Previously, when Office 365 Group creation in SharePoint Online was disabled, site creators were limited to only creating a “classic” team site. This change lets site creators use modern team site templates even if Office 365 Group creation is disabled. Additionally, your users can now create communication sites even if Office 365 Group creation is disabled. As a result of these changes, the “hybrid” option in self-service site creation settings is no longer necessary and we’re removing the selection from the settings. If your organization is using the “hybrid” setting, you will notice the title selections have changed. A site that currently uses one of the new team site, communication site, or “classic site” templates will become “A new team site or communication site.” - We’ve improved subsite creation settings (32588): In the past, subsite creation settings were enabled for all SharePoint Online templates and could be disabled for Office 365 Group-connected team sites. These settings only appear in the menus display on site contents page. With this change, we’ve extended these settings to apply only to “classic” site templates and we are enabling the option for you to disable them for all site templates. If you have elected to hide the subsite menu command for Office 365 Group-connected team sites, the setting title will change to “Show the subsite command only for classic sites” and when selected, will hide the option for all modern site templates. - Language selection options for SharePoint Online sites (31088): Lastly, we’re adding a language selector setting on the self-service site creation form, which allows your users to specify a default site language that’s different from your organization’s default setting. We’ll begin rolling these changes out to Targeted Release organizations this week and the roll out will be completed worldwide by the end of August. We’re updating the List and Document Library web parts. We'll be gradually rolling this out to First Release customers in early June, and the roll out will be completed worldwide by the end of August. In order to enhance the SharePoint page authoring experience, we are introducing a new "Weather" web part and updating the existing "Image" web part. These features will begin rolling out soon to Targeted Release customers in June and the update will be available worldwide by the end of July. This message is associated with Office 365 Roadmap ID: 27740. The "Weather" web part will allow SharePoint Online page authors to configure the web part to show weather information provided by MSN Weather for a location of the author’s choosing. The "Image" web part improvements will allow authors to provide text overlay on an image, plus add a clickable hyperlink associated with the image. There is nothing you need to do to prepare for these changes. Please click Additional Information to read about What's new for your intranet in Office 365 including additional details about the new "Weather" web part and updates to the "Image" web part in SharePoint online. Microsoft is  updating metadata and content filtering in SharePoint Online to make organizing content easier. They will be rolling out this update beginning in mid-June and it will be available worldwide by end of July. This message is associated with Office 365 Roadmap ID 27251. You don't need to do anything, but may consider updating your user training and notifying your helpdesk. Please click Additional Information to read about What's new for your intranet in Office 365 including additional details page metadata and content filtering in SharePoint online. With this change, you will see updated terminology across the Office 365 admin center, Exchange admin center, and Azure admin portal. The 'Type' column will now be referred to as ‘Group Type’. This column will now include values of ‘Office 365’, ‘Mail-enabled security’, ‘Distribution list’, and ‘Security’. The concept of ‘Distribution Group’ will now be referred to as ‘Distribution List’ throughout experiences such as group creation, edit, and upgrade. If your organization has a dependency on the previous values being present in the 'Type' column within the user experience, you will need to update your dependencies to use the new terminology. Please click Additional Information for more information about this update. 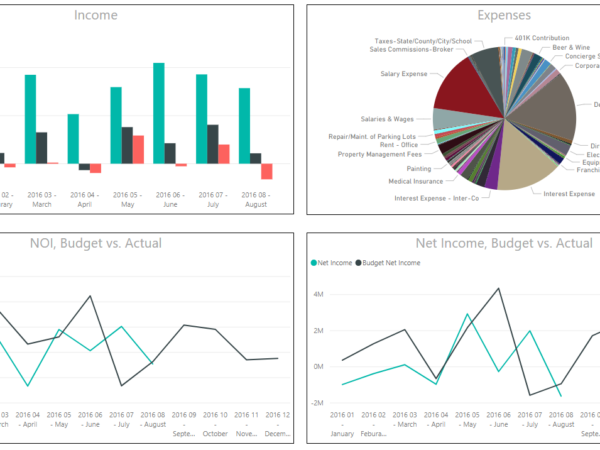 [post_content] => In this Office365 article you will learn how to enhance how you play the Great Game of Business and get beyond traditional desktop tools like Excel for financial forecasting and score boards. Open Book Management is a powerful tool to grow profitable businesses that benefit all employees and stakeholders. At the core is financial literacy, which includes weekly financial forecasts that are reported in weekly huddles and presented on white boards, so everyone can follow the action and keep score to know if they are winning or losing the game of business. We will teach you how to use financial data from accounting and merge it efficiently with weekly forecasts from the departments and teams in the game. Learn new tips and tools to automate the busy work using technology that is cost effective and you probably already own such as Office365, SharePoint and PowerBI and others to make amazing and insightful financial score boards. 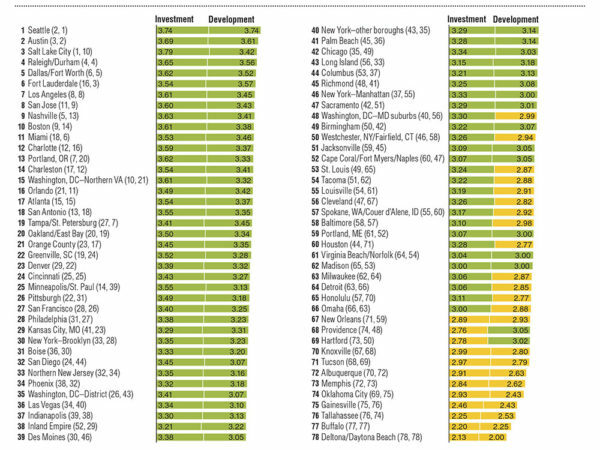 Is our financial forecasting efficient? Is our financial reporting secure? In many organizations we see the financial reporting and forecasting working something like the follow. How does it work in your company? Actual financial results are reported weekly, monthly, quarterly, and annually from the accounting team using the financial management system. Forecasters – each of the employees responsible for forecasting a critical number and streamline the time they spend analyzing and updating their forecast if the data and reporting was automated at some lever. Also, the teams and managers that help collaborate to review the forecast can streamline the steps using software automation in many cases. Co-Author in Excel – you can have many simultaneous users working in the same spreadsheet document. This allows for parallel workflows not sequential routing of documents and versions. SharePoint is a powerful tool that you probably already own if you have Office365. It comes free with the Enterprise license. Here are some great ways you can use it to help manage and optimize and automate the business processes that deal with financial data and financial cost management. Here is an example of Project Tracking SharePoint data list the company uses to track all high level project costs. See the Project Numbers, Job Cost Codes and other information needed to tie Projects to Financials. Here is an example of tracking specific time for tasks for employees and contractors. SharePoint can have forms and lists on the same page, making it simple to track and manage time reporting and actual hours spent vs. forecast hours. In this example we track all the invoices for accounts payable to sub-contractors and accounts receivable for us to bill our clients for our work. This AR/AP SharePoint page helps manage the workflow of authorizing work, getting business sign off, and collaborating with accounting on what invoices to send out and what invoice to pay. This streamlines the AR/AP process across the company. We track the hours, and costs billed to each project. Here are some examples of how you can use BI Tools to create new Score Boards for the huddles in the Great Game. In this example the executive view combines all the financial metrics a leader wants to see from the Profit and Loss statement, Balance Sheet and Income Statement. You can also roll up a number of projects, entities, or in this case, real estate asset entities. This is very powerful because it pulls from multiple General Ledgers to roll them all up together across a portfolio of investments. 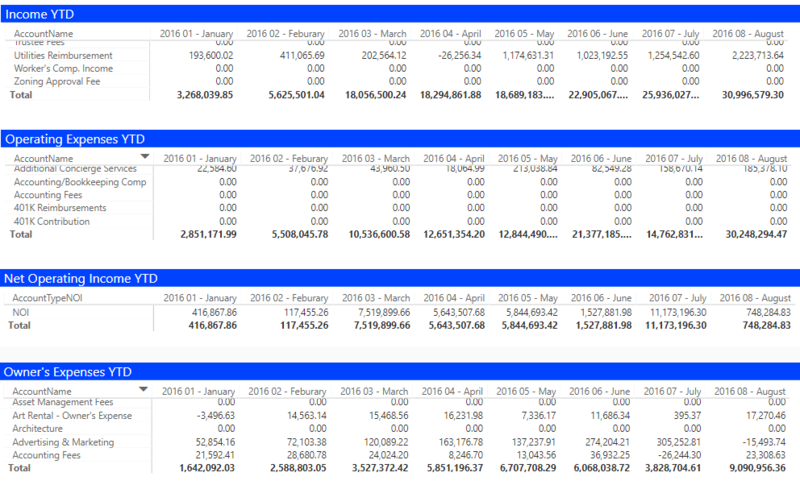 In this example you can see all the accounts and categories for the financial statements compared to Year to Date so people can quickly verify where they are in their budget. Summaries are by Month of the Year. In this example we see a roll up of all costs for all financial statements, and compared against the forecast. It reports on the Variance from plan and alerts you immediately to any issues across the full suite of financial metrics, all on one screen. Here you see clear visual trends that tell a story and communicate if you are “winning” at a glance. These graphics can steer you immediate to the important trends, success, and problem areas in your business. Imaging the possibilities if all employees had this information at all times on their laptops, tablets and mobile devices. That would be financial literacy at its highest level. Project Management + Financials = job cost control. Integrating project management and project job costs is critical. 1 Way Sync – Push data out of system automatically to another system so you can share the data across the enterprise, but you don’t have to pay more for more licenses of the software. This saves money in the long run. 2 Way Sync – Push and pull data in and out of systems automatically. This is when systems “talk to each other”. They are smart enough to send data out, let other review and approve it, and push the data back, with no manual work needed. This is very efficient and cost effective, and gets costs down to pennies per transaction. HingePoint offers cloud and mobile applications for construction and real estate that are easy to adopt and employees love. Specializing in the systems that run the construction and real estate business including SharePoint, Salesforce, Procore, MS Dynamics, and Autodesk. Scale and grow profitably with Financial and Project Management Dashboards with SharePoint, document management with SharePoint, and workflow automation for field to office collaboration. [post_content] => In this video demo we show you how we coded a SharePoint App Management Console that allows users to configure the API integration between SharePoint Document Libraries and Procore Document Modules for your projects. 1. You start at the point after you have installed the custom Management Console App in your SharePoint site as a custom App. In this example we watch SharePoint doucments move over in real time. It works very fast, as fast as Procore and SharePoint will allow the API to push data it is queuing up date to migrate over. If you want a live demo or to test the application contact us or visit our site to learn more and schedule a demo. 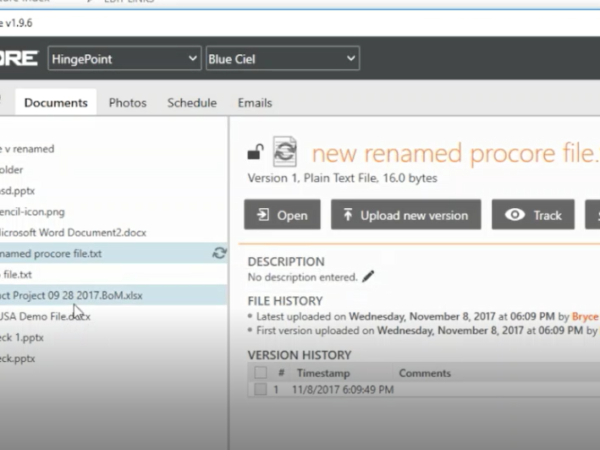 [post_content] => Watch a live demonstration of how the Procore-SharePoint 2 Way Document Synch connector works. Many people love Procore for field construction management and many companies standardize their collaboration and document management on Microsoft SharePoint. The Benefits of SharePoint and Office365 to Construction Managers? Note: You can use SharePoint for project management no matter what industry you're in. 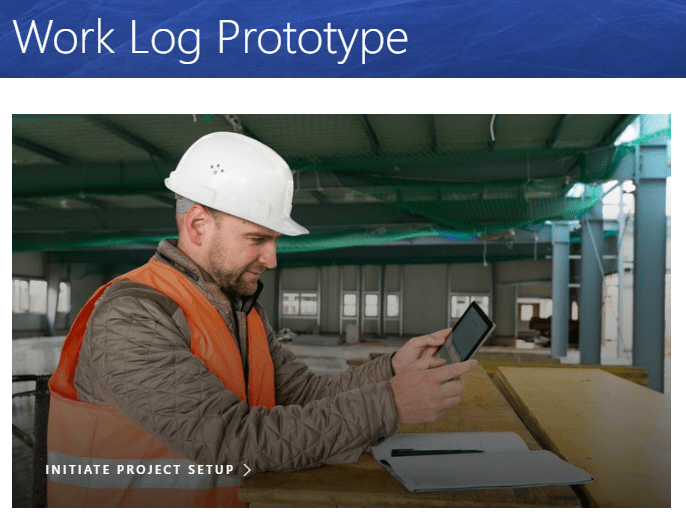 We like to create a nice SharePoint site for the construction team, where they can easily manage all their projects. A good intranet page for the company can be used as the starting point for construction projects. On the screen below you see a link on the home page to all the Projects. This links to a site for both estimating to track pending jobs and construction managers to track active projects. This example is built in SharePoint online with a communication site template. That links you to this SharePoint List of all pending projects or New Construction Projects. Use this information to coordinate and plan team resources and who will be key resources on the projects. When resources are scarce and teams are busy, it is not easy to find the right leaders for all the work coming up in the pipeline. 3. Quick Edit allows you to edit all the project data all at once. Many users love this feature. On Schedule (this is everything in construction. Typically if you can stay on schedule, things are going well). Outlook Email is a great way to quickly share project information. SharePoint can send a "notification" email to anyone you want when you "trigger" that notification within SharePoint. If you Click Save from the New Project Set Up Form this triggers Office365 to send an email notification. The first email that goes tells management of the new job. All I have to do is click "confirm" button to respond from within my email inbox. I get a confirmation message from SharePoint and it also sends me a confirmation email that lets me know that it was responded to. The estimator can meet with the construction project team to go over all the information on the job and collaborate on project planning. As you assign people they get this email notification automatically. Now the Project Manager can see all the data they need about the project, as well as the date it was logged. The PMs can now take over and do what they do best and start to manage the scope, schedule and budget of the project. As they plan the work and "work the plan"  The team enters updates to the budget, forecast and actual hours, etc. 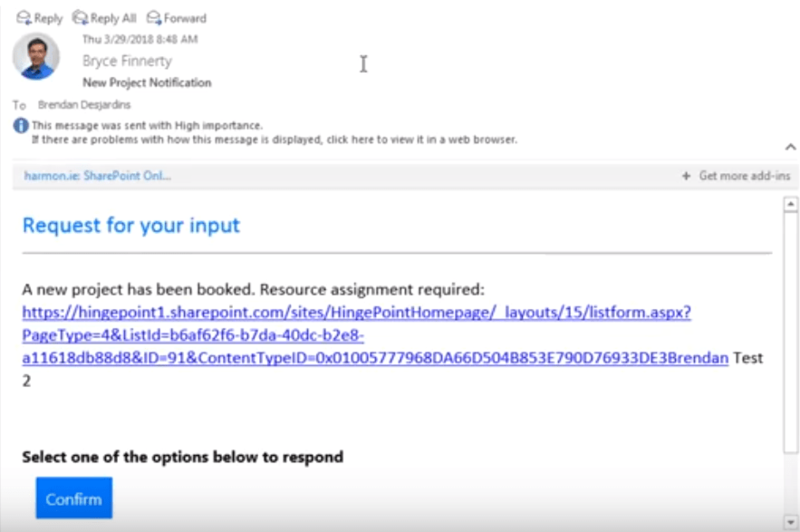 If they click the link in the email they go straight to the source of the information in SharePoint so everyone is on the "same page" with project information. We demonstrate how we set up a workflow that will notify the team members by email if there are any edits to the project information. This keeps everyone in synch, singing off the same song sheet, using the most up to date information. This is where the magic happens because SharePoint can elimiante a lot email and coordination meetings since everyone has accurate, up to date information, available from their phones, laptops, and any device, from any where. Here is a screen shot of what the Link in the mails goes to. A screen of all the project information in SharePoint. [post_content] => Microsoft has officially released SharePoint hub sites and is gradually rolling them out to Office 365 customers. 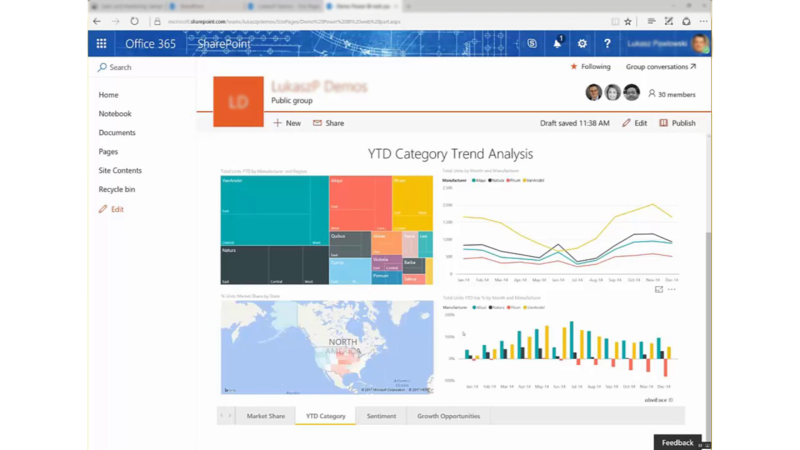 The first announcement of SharePoint hub sites was last fall at Microsoft Ignite. What is a SharePoint hub site in Office 365? SharePoint hub sites combine news and activities from your different associated sites and display the roll-up on the hub’s home page. This could potentially have a significant impact on the way you construct intranets and departmental sites within your organization. The association can be changed whenever you like, meaning that making changes to the organizational structure will be as simple as adjusting a setting. When you search from a SharePoint hub site, content on the current hub site, as well as content on any associated sites, is displayed in the results. Users searching for items will only see results for which they have access to. This feature greatly simplifies the process of managing what information users have access to. Q: When can I expect to see SharePoint hub sites appear in my Office 365 tenant? A: SharePoint hub sites with begin rolling out to Office 365 First Release customers in the first half of 2018. Q: Can I join one SharePoint hub site under another hub site? A: No, you won't be able to join a SharePoint hub site to another hub site. Q: Can a team site or a communication site be joined to more than one SharePoint hub site? A: No. It will only be possible to join a site to one hub site at a time. It is possible to link to various unjoined sites in the top navigation. And it will be possible, within seconds, to join and/or unjoin a site as the business changes. A: Hub sites are designed to let you dynamically organize closely-related sites, bringing together similar projects, binding related assets, and presenting common activity. Customers with portals that include customization beyond the web parts and extensions that the SharePoint Framework currently supports are likely to continue using the SharePoint publishing infrastructure, which continues to be fully supported in both SharePoint Server On-Premises and SharePoint Online. Q: When should I use a team site? When should I use a communication site? A: Your SharePoint team site lets you share content, knowledge, news, and apps with your group as you collaborate on a project. A communication site lets you tell your story, share your work, and showcase your product across the organization. We can't wait to start planning and constructing solutions with SharePoint hub sites in 2018. HingePoint believes hub sites will be most valuable in an intranet scenario because of the navigation abilities of cross-site collections that have been lacking in previous SharePoint versions. If you're trying to customize SharePoint hubs to meet your organization's unique needs, we'd love to hear what you're looking to accomplish! Feel free to start a live chat with our solution consultant on this page, email us, or call us at (214) 301-0000 to get started today. HingePoint offers cloud and mobile applications for construction and real estate that are easy to adopt and employees love. Specializing in the systems that run the construction and real estate business including SharePoint, Salesforce, Procore, MS Dynamics, and Autodesk. Scale and grow profitably with Financial and Project Management Dashboards, SharePoint document management, and workflow automation for field to office collaboration. [post_title] => What is a SharePoint Hub Site?